Full disclosure: I’m a 33-year-old introvert who sees their smartphone as a dreaded thing I use almost solely to get GPS instructions, listen to audiobooks, and text friends and family for the occasional social event. I am also not the target demographic for your business – unless you happen to sell video games. However, what I am is a guy who monitors and analyzes the traffic of my clients and marketing industry trends. If you’re anything like me, you’re going to be surprised at how much the smartphone might be ruling the traffic to your website, social media platforms, and Google searches. This article is designed to help you understand the why behind this trend, and if this is something you need to consider for marketing in your industry. Below are some interesting stats for smartphones – how many people use them, how many are dependent on them, how many spend on them, and how many browse the internet on them. These statistics were pulled from the Pew Research Center Mobile Factsheet and 10 Facts About Smartphones, as well as Mobile Website Traffic from Statistica. Check out both websites for more interesting facts. 75% Smartphone Ownership: Over 75% of Americans own a smartphone, with urban usage at about 85%. 46% Can’t Live Without: While 54% surveyed said their smartphone isn’t always needed, the other 46% said they couldn’t live without their phone. 1-in-5 Smartphone Dependency: Today one in five households is “smartphone only,” meaning they have smartphones but no broadband internet at home. 50% Online Purchases: Over 51% of Americans have made purchases via their smartphones using apps or the internet. 50% Mobile Website Traffic: Worldwide, 51% of worldwide website traffic comes from mobile devices, up 20% in only the last three years. It’s no surprise when you look around outside, at a café, or on a bus, almost everyone you see is listening to, watching, or typing on their smartphone (a few might even be using it to make a call). How did we get there? There are three major factors to consider. How many things do you do on a smartphone that you can do on a traditional one? The truth is, today’s phones have more in common with computers than phones. Messaging, email, using apps, and browsing the internet are the primary uses for a smartphone in the hands of most consumers. Okay, when it comes to the latest iPhone, “cheap” might be a relative term. But compared to your average computer, phones come pretty cheaply, especially with contract deals that have you paying the cost of the phone out over months. One of the core tenants of social media is connectivity, with one of the primary drawbacks being FOMO (Fear of Missing Out). Having your social media and its notifications available at all times is good for social media (it means more ads and user data), so they jumped onto the phone as soon as possible. That 50% mobile web traffic? That’s an average. 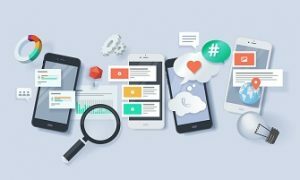 Some websites, especially those specifically focused on mobile capture (such as mobile apps and review sites), will see a much higher number, while other websites that require more careful study or use will see more desktop use. How do you find out yours? I recommend Google Analytics. By installing code on your website, you can track how users find you. This includes not just mobile vs. desktop (and even tablet), but also what kind of device they are using (Apple or Android). This can tell you how many people visit your side, and what they are (or are not) doing on your website. Make Sure Your Website is Responsive: A “responsive” website is one that can scale its elements to be read on any device, from a smartphone screen to a laptop. Update Your Info on Mobile-Friendly Listings: Make sure your information is accurate on listing and review websites like Google, Yelp, and any industry-specific sites. Be Active on Social Media: As mentioned before, social media is the domain of the smartphone. Educate, entertain, and engage with users there to have them check out your website. Advertise to the Mobile Crowd: Online advertising (from Google AdWords to Facebook Ads) can allow you to target (or exclude) mobile devices with your ads. Get an App for That: If you want to provide a service beyond your website, think about building a mobile app for your service or product. Getting your website and business model ready for mobile customers can be a lot of work. We can help. It’s time to contact Vision Advertising. We’re a full-service marketing agency, specializing in comprehensive internet marketing – from websites to social media and everything in-between. Contact us today to start the discussion and find out if partnering with our digital marketing agency is right for you.